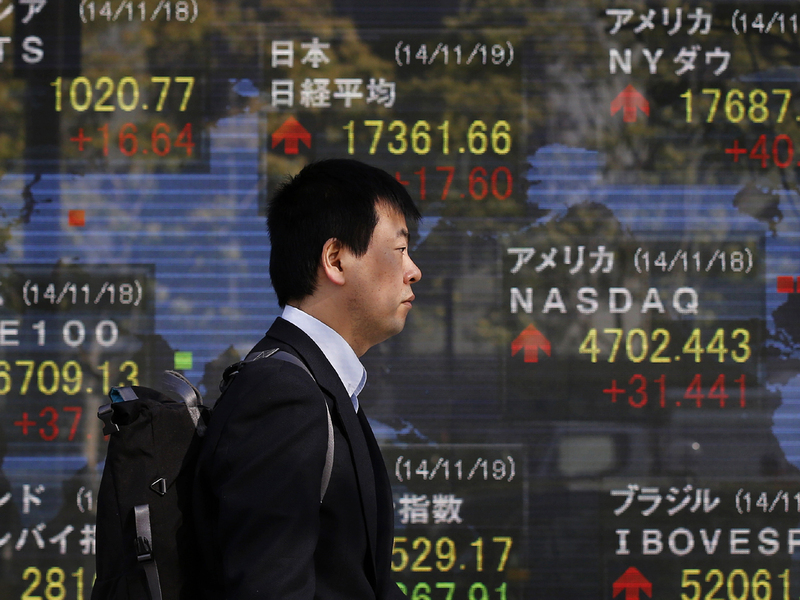 World stock markets were lackluster Wednesday as investors digested a fall in Chinese home prices and Japan's scramble to overcome its economic malaise. Germany's DAX was down 0.1 percent at 9,446.95 and France's CAC 40 shed 0.2 percent to 4,254.50. Britain's FTSE 100 dropped 0.3 percent to 6,692.19. Futures augured a muted open on Wall Street after the S&P 500 again reached a record high on Monday. Dow and S&P futures were essentially flat. After shelving a tax increase planned for next year, Prime Minister Shinzo Abe called a snap election for December to renew the mandate for his all-or-nothing "Abenomics" effort to end Japan's two decades of economic stagnation. The economy's slide into recession after April's sales tax hike has underscored its fragility even as the government and Bank of Japan carry out unprecedented stimulus efforts. "There is growing condemnation of Abenomics and whether its stated goals are achievable and whether the policy settings are correct," said Evan Lucas, market strategist at IG in Melbourne, Australia. "I remain convinced that whatever the outcome of the election, the BOJ will continue and even increase its stimulus program as will any Japanese government and, in turn, that will push equities higher." Japan's Nikkei 225 fell 0.3 percent to 17,288.75. It gained 2.2 percent the day before on news the government had delayed a second sales tax hike in response to the world's third-largest economy slipping into recession. Hong Kong's Hang Seng fell 0.7 percent to 23,373.31 and China's Shanghai Composite Index dropped 0.2 percent to 2,450.99. Australia's S&P/ASX 200 lost 0.6 percent to 5,368.80. Markets rose in Taiwan, Singapore and Indonesia. Benchmarks in South Korea and Thailand fell. Further softening in China's property prices has pushed down stocks linked to iron ore, copper and steel. In October, house prices contracted in 69 of 70 cities tracked by the government and the drop overall was 2.6 percent, figures released Monday showed. As property is a significant driver of growth in China, the weakness suggests its economic growth will continue to slow from the 7.3 percent recorded last quarter. Benchmark U.S. crude was down 43 cents to $74.18 a barrel in electronic trading on the New York Mercantile Exchange. The contract fell $1.03 to close at $74.61 on Tuesday. Brent crude was up 26 cents at $78.73 in London. The dollar rose to 117.48 yen from 117.12 yen late Tuesday. The euro rose to $1.2532 from $1.2523.